Text and pics contributed by Christina. This was a repeat of a hugely informative earlier event which proved so popular we held it again. For some of us it was a bit of a rush to get to the cycle shop at 6.30pm. 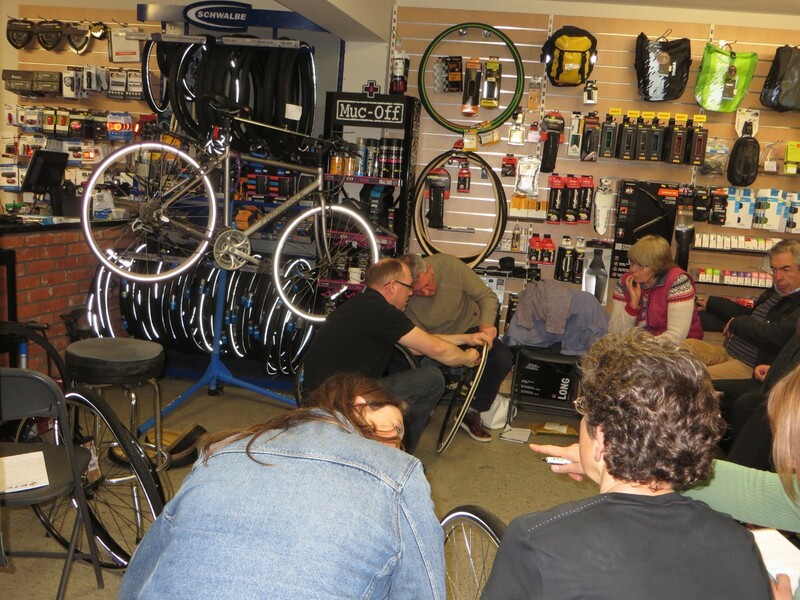 Like last year Steve hosted a two hour talk and hands-on demo of chain maintenance and different tyres and how to use the gears in a way which protects the chain – avoid big jumps and instead “keep the chain in a straight line”. Over a warming cup of tea (probably no heating at this time of the day) we wrote our questions on a piece of paper, and most of them got answered in the course of the evening. Did you know that treaded tyres look nice, but they are only of use if you ride on soft ground such as mud or grass? Steve explained it is best to buy puncture resistant rather than puncture proof tyres, and not to buy gel-filled tyres: they are messy, rather heavy, and you can still get punctures. Other interesting topics we covered were how to fix a puncture and replace the inner tube with the right technique, without a trusty spoon or using a tyre lever or anything other than your hands (buy a thin lever only if you must). We were told what essential puncture repair kit to carry and were amazed to learn that a £5 note put inside the tyre can make all the difference since it has the right size and apparently does not tear. For me it was the second cycle maintenance evening and I still learnt a lot, and some matters became clearer the second time round. For Janice and her husband Colin and for Glenys’ daughter Sophie it was their first IOG event. Janice e-mailed me afterwards to say it was an evening filled with interesting detail and also most enjoyable. A massive thank you to Steve for having us after a probably long work day.